Woody Allen's movies have a character of their own. And this is simultaneously good and bad. It is good because you can hardly encounter a film of Allen's that is of low quality. And it's bad since you are rarely surprised by his films. Hannah and Her Sisters is not bad by any means. But it is also quite overrated. The movie is neither as good as Annie Hall or Manhattan nor it is as refreshing as Midnight in Paris. It is a must for Woody Allen's fans but at the same time you can find better Allen's films if you just want to taste his works. The movie sports some really good acting though, which you may like in either case. 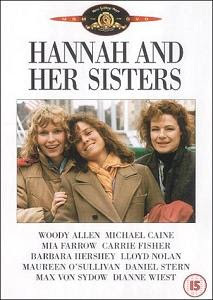 Hannah and Her Sisters revolves around Hannah (Mia Farrow), her husbands, her 2 sisters and the mess in their relationships. Hannah's present husband Elliot (Michael Caine) falls in love with her sister Lee (Barbara Hershey) while Hannah's ex-husband Mickey (Woody Allen) shows interest in her other sister Holly (Dianne Wiest). These are only a few of the complications though, because Mickey thinks he has a brain cancer, Holly has a friend (Carrie Fisher) who steals her projected boyfriends, Lee has a romance with a misanthrope painter (Max von Sydow) and Elliot is obviously restricted by his marriage to Hannah. The 3 sisters' parents are also not an ordinary couple so this big family has a lot of problems to have fun with. The problems the audience has are not so complicated and they are mainly related to the nature of the film. It's a movie completely in the vein of the majority of Woody Allen's works. There is a little surprise. The dialogue is not so witty as in Allen's previous masterpieces. The narrative is boring at times. A spectator gets exactly what one would expect from Woody Allen, only not so original or captivating. The mess in the beginning, which fortunately unravels fast, is so huge that initially I used to think Carrie Fisher's character is one of Hannah's sisters. Well, she's not. Which also means she does not have much screen presence so if you are a Star Wars fan do not count on seeing Princess Leia in this movie too often. Nevertheless, the film has a good side. The strong performances some of the actors demonstrate make the movie worth seeing despite its flaws. Michael Caine and Dianne Wiest won Oscars for their roles and they are really great: Caine is calm, confused and ordinary looking; Wiest is irritating, chaotic, constantly fighting for her chances in love and life while at the same time she's easily vulnerable. Without winning Academy Awards the rest of the cast is also superb. The other two sisters are fairly interesting due to the competent work of Mia Farrow and Barbara Hershey while Max von Sydow would have fitted well in a bigger role. Woody Allen won his second Oscar in the category of Best Writing for Hannah and Her Sisters but I do not find the screenplay so award-worthy as the acting performances. It contributes to the film's predictability and lack of originality: we've already seen "this movie" and we've seen it better. Yet, for cinema and acting buffs, it could be a pleasant and rewarding experience to explore the variety of characters skilfully portrayed in the film.